Puzzle Activity: Set up 3 stations using actual puzzles or use the written scenarios/analogies and no puzzles. Both will work so use what will work best for you. Divide students into groups of 2-3 and have them visit each station or provide them with the written scenarios to discuss. #1: If I gave you a baggie full of puzzle pieces and it contained more border pieces than inner pieces and asked you for the analogy of this to eating patterns/habits, what might you come up with? #2: If I gave you a baggie full of puzzle pieces and it contained more inner pieces than border pieces and I asked you for the analogy of this to eating patterns/habits, what might you come up with? 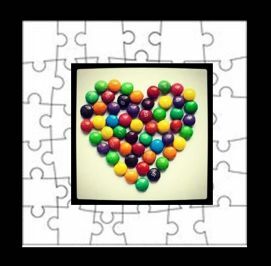 #3: If I gave you a complete puzzle and all pieces fit together to make a picture and I asked you for the analogy of this to eating patterns/habits, what might you come up with? Discuss analogies. Note to teacher: You may get a lot of interpretations for this activity and there are no specific “right or wrong” answers. I wanted students to critically think about the connections. This activity just illustrates that we all look at food differently and interpret the intake/consumption of them in various ways, sometimes, making it a bit confusing to know what we should be eating. American diets are full of nutritious foods, but are we consuming them? Most Americans need a little help and guidance. This is where the Dietary Guidelines come in. Assign the Dietary Guidelines M&M Challenge to learn more about the dietary guidelines. This can be an individual, partner or small group of 3 activity depending on your class. Set a time limit for students to complete this challenge prior to starting. Again, base it on your class and period length. Students are to open their M&M’s and complete the challenge information based on the number of specific colors found in their package(s). Students will utilize this website for their information. So, if students have 3 brown M&M’s, then they need 3 answers for the prompt in that section. Instruct them not to eat the M&M’s until directed to do so! Once the time limit is up, students will share and discuss the information they found. They are also to write in anything shared about the prompt that they don’t have written on their own chart. To summarize the dietary guidelines, I like to show my students YouTube Clip #1 and YouTube Clip #2 and while they are viewing them, they may eat their M&M’s. DOES THE FUN SIZE SNACK PACK OF M&M’S FIT INTO THE DIETARY GUIDELINES? EXPLAIN, CITING EVIDENCE FROM THE RESULTS OF THIS CHALLENGE TO SUPPORT YOUR RESPONSE. ONE PARAGRAPH (5 SENTENCES) MINIMUM REQUIRED. Note: After introducing students to the dietary guidelines, I do break them down into more detail by focusing on the essential nutrients, nutrient dense whole foods, and limiting sugars, fats and sodium in the diet.